"GrimJack can be a bit...intense. But his bar, Munden's, serves the cheapest rotgut in the multi-dimensional city of Cynosure. When you and a few other regulars arrive that night, you discover that someone has trashed the place and kidnapped GrimJack. Who grabbed him, where'd they take him, and how many heads will you have to crack to find out? (No familiarity with GURPS or GrimJack required)." Much like my Jem con game, this game also came about after a conversation on the Happy Jacks forums. 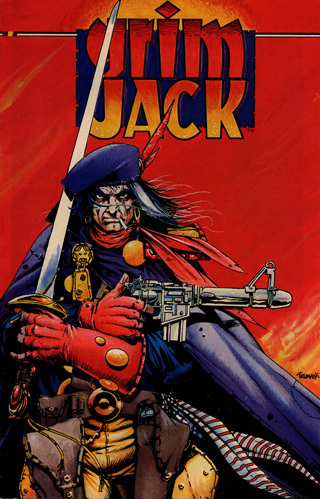 The thread was for people to put forth their favorite setting or genre - for me, that's often Cynosure and GrimJack. Others seemed interested so I decided to give it a whirl, and this game was the result. The game was written for six players at a convention, so I created eight pre-generated characters for them to choose from. Here you can view/download the adventure itself, a few "extras," and the GM control sheet. These are the setting notes I created for a Cynosure campaign many years ago. The biggest disease today is not leprosy or tuberculosis but rather the feeling of being unwanted, uncared for and deserted by everybody.